"IT'S THE END OF THE WORLD AS WE KNOW IT . . . AND WE ARE FINE." It was apparent as soon as I arrived in Peru. I could feel the Golden Cities of Light. An Enchanted Age is returning. It is an answer to an old dream that I almost forgot. The past is gone, wiped clean, and a new world is emerging. All history is being left in the past. The door to the past is closed and sealed. After over 20 years worth of travel in the Americas and 11 consecutive years of traveling in Peru, I can now see the beginning of the dream coming alive. We indeed have made the shift. The future begins now. The wait is over. Sacred sites operate at an ever evolving higher frequency than the rest of the planet. This is partly due to the continual and uncountable years and ages of use of these sites for spirit growth. Everything in the 3D world was once created in time and space, in the spirit world first, and then will manifest quickly thereafter. Because of this, an echo of what is coming in the future is felt in a sacred site first. It is one of the reasons that so many feel drawn to sacred sites. If we can feel this emerging world returning in the etheric, this new world is on its way and will manifest soon. What the Star Elders shared prior to this year's equinox is now confirmed (see past article here). 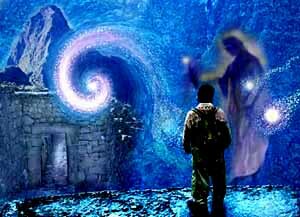 During the course of our 2 ½ week pilgrimage in Peru, Lord Meru and Brotherhood of the Seven Rays, the Star Elders, and the ever present Archangel Michael gave me a glimpse of this Enchanted Age that we just entered, and some clues to what we might experience here and now. I could feel this quite clearly when I faced my favorite mountain . . . Apu Putukisi. The locals call it "the Enchanted Mountain". The last 104,000 thousand years has been about creating and then healing past actions, as a learning experience. Now our spirits have learned what we needed to know. We will not re-create our mistakes if we stay positive. From Atlantis to Hiroshima, through all time, past to now, we have cleaned out and healed all miss-creations to date. Now it is up to us to keep this new environment clean. We are now clear to move forward, but do we know how to move forward? I received some clues to this also. We will find that the way we have been approaching our spiritual lives will need to evolve to give us the same clarity, harmony and peace. In fact, all spiritual practices are being recalled for much needed upgrades. Mediation, Mantras, Yoga, Ceremony and other spiritual techniques will be evolving quickly into more potent practices. Healers will be called on to find new improved ways to help others. It is time to unleash what we know inside, so it can evolve into the "Something GREATER" that Jeshua speaks about. Spirit is saying that it is time to come off the mountain and begin to LIVE the Enchanted Age now. We will not find it effective to process the past anymore. This is true for past pain, suffering, lack, abuse, abandonment, and betrayal etc…. What has happened is that we have turned completely around and have begun to move in the opposite direction. That direction is toward our future. We have left the life based in "what was" . . . and into a life that is based in the unlimited potential of "what is". Our spirits have done a 180 degree flip and we are now processing our future. It is kind of an interesting concept isn't it? Processing the future? How do you do that? I can imagine that we will say "How are you? ", and we will reply "Oh . . . I'm just processing another level of bliss!" I think I can handle this. The Masters say . . .
"The door to the Enchanted Age is open to ALL who wish to enter. Your passport to the Enchanted Age is a quality of heart. All those that are of service to humanity are entering a State of Grace. If you are a healer, mail person, a farmer, and builder, a teacher . . . any work that made someone's life better, you are entering this State of Grace. When you offer services that help humanity in any way, this State of Grace clears your shadows and clears your karma for you. It is a divine dispensation of Light." "Let us remind you, if those adhering to a spirit life and the sacrifices that go with it had not been holding the light on the planet for all this time, the enchanted age would not have arrived at all. The ones that held the 3D world together for humanity would not have the Enchanted Age to enter. But also you see the light workers would not have been able to maintain this spiritual work unless countless others made the sacrifice to deliver your mail, and grow your food, help the children and the elderly, and teach you right from wrong, etc…. You see . . . you where all working together all along!" "Those who have never felt at home in this world are now being called on to be a living bridge to the Enchanted Age. You've been cleared of your past. It doesn't matter how your life has been up to now. Let it go. Today is a new day. Your past pain, trials and mistakes are all wiped clean. You have been draped with a cloak of energy that incases a building energy inside of you. This cloak of light is creating an eternal bridge for a consciousness that will manifest the Enchanted Age. The bridge only moves forward." It was apparent that our work in Peru was complete as we stepped off our boat on our return boat ride from Lake Titicaca. We had begun our journey home. The Thunder Gods that welcomed us on our first day in Peru were now saying goodbye in bursts of lightening behind us. The sacred space that we entered on our first day was now sealed within us. We could all feel it. In less than 24 hours, most of us would be on a jet going home. It was a quiet moment. The journey was complete.